The Holy Inquition is the Start Point of the Game. At the beginning of the game the Philosopher Thomas Campanela meets the Clemente Erzini (the only creature at this area) and has a conversation (clementefinal converastion) with him. At the end of the conversation Thomas Campanela has to collect all the Books that describe the movement theories of Aristotle. 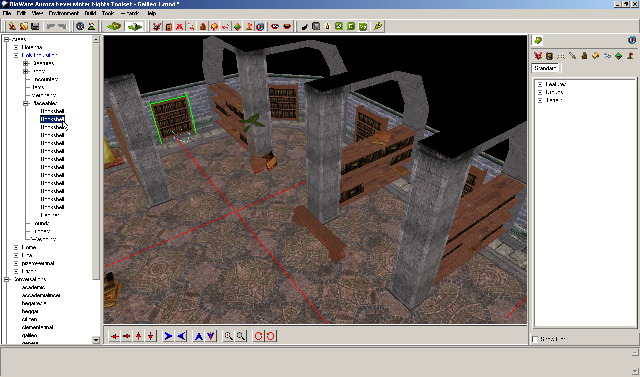 There are 13 bookshelves (placeables) and 1 cabinet (placeable) that contain all the useful books. When the Philosopher Thomas Campanela collects all the books, he has to open the InquisitiontoPiza door (door) in order to be transferred at the Piza’s square. You will find that there is not much need for you to create your own placeable objects. 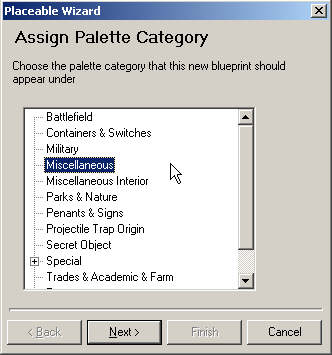 The Standard placeable blueprints palette (and the Custom one if you have CEP installed on your module) is well supplied with such objects, and all the possible appearance types for placeables are listed somewhere in the palette. If for some reason you still feel the need to create a new placeable object blueprint, the Wizard might be the tool you are looking for. STEP 1: The first step of the placeable object creation process is to choose in which category you want the blueprint of your new placeable object to be archived. STEP 2: For the second (and last) step of the placeable object creation process, you choose a new name for your new blueprint and... That’s it. You can of course tick the “Launch Properties Dialog” box if you want to edit the properties of you placeable object. The other way to create a new blueprint for a placeable object is to create a copy of an existing one and customize it to fit your own purposes. 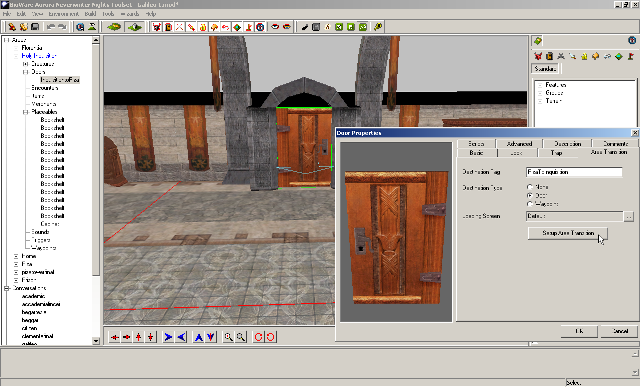 In order to do so, right-click on the placeable in the palette you want to use as a model, and select the “Edit Copy” option from the dropdown menu. 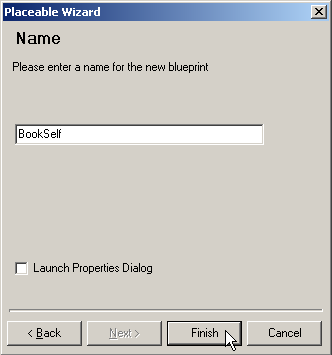 Another method is to add the placeable you will use as a template to an area, edit its properties and, once you are finished, right-click on it and select the “Add To Palette” option to make it a blueprint in the palette. A. Name: The name of your placeable object is for you to choose. By clicking on the “...” button next to it, you can edit the name that will appear to players using a foreign game version of NWN. B.	Tag: The tag of your placeable object is mainly useful to identify this object in a script. C.	Appearance Type: You can give any appearance type to your placeable object. This property is mainly aesthetic and will not affect the other properties of your object. 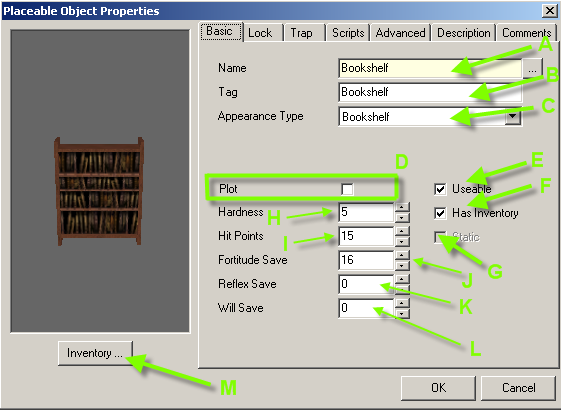 D.	Plot: If you tick the “Plot” box, the placeable object cannot be destroyed. Do not forget that placeable objects can not only be destroyed by players bashing them, but also by area of effect spells. E.	Useable: If you tick the “Useable” box, your placeable object will be selectable by players in the game. Players clicking on the object will then fire the OnUsed scripting event of your object. F.	Has Inventory: If you tick the “Has Inventory” box (which can be done only if you have first made your object “Usable”), then your placeable object will act as a container. The object then becomes selectable for players in the game and any player clicking on it will open its inventory, assuming it is not locked or in some other manner not easily opened. G.	Static: By ticking the “Static” box, your placeable becomes part of the tile where it is located and no longer interacts in the module in any way. It is important to understand that scripts assigned to a static placeable object will not run. It is strongly recommended to have all placeable objects that were placed in an area only for an aesthetic purpose to be made “static” to limit the usage of your engine memory. H.	Hardness: The hardness value tells you how many damage points the placeable absorbs on a successful hit without being affected. As an example, if the placeable object has a value of 5 to its hardness, then a player will need a weapon that does at least 1d6 of damage to be able to bash it (and will do 1 point of damage on rolls of 6 only). Any weaker weapons will be ineffective. I. Hit Points: This value is the same as for any creature or player character. It determines how many damage points you have to inflict to the placeable object before you destroy it. J.	Fortitude Save: A placeable object can be the target of a spell. The fortitude save will therefore determines how well the placeable object will resist a spell that allows for a fortitude save. K.	Reflex Save: The reflex save determines how well the placeable object will resist a spell that allows for a reflex save. L.	Will Save: A The will save determines how well the placeable object will resist a spell that allows for a will save. M.	Inventory: Any placeable object can act as a container. In order to activate this option, you must first tick the “Has Inventory” box. 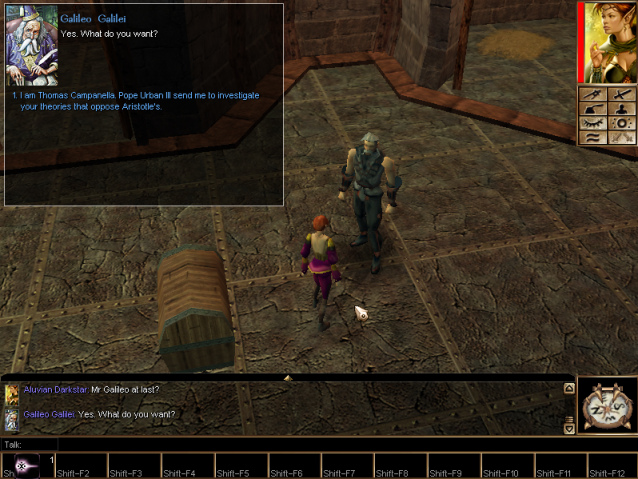 Then, when you click on the “Inventory” button, you can add any item you wish to the placeable object’s inventory. By clicking on the “Inventory...” button, you can determine what the store sells, and in what quantity it has them. See the inventory contents screen shown below. A. You can add items by choosing them from the item palettes. Double-click on an item in the palette to see it appear in the inventory contents of your store. B. Drag and drop an item in the inventory contents to the trash can if you do not want this item. 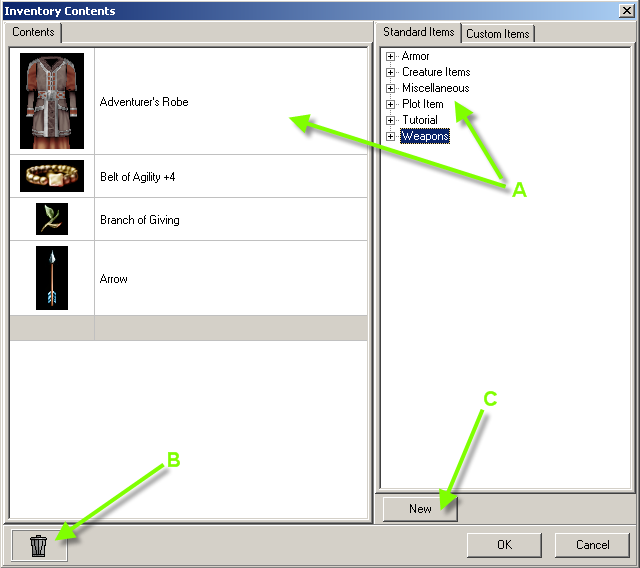 C.	By clicking on the “New” button, you will launch the Item Creation Wizard that will add custom items in the palette.